Preeclampsia is a multifactorial disease caused by complex interactions of genetic and environmental components. Accumulating evidence suggests that genetic contributions to the pathogenesis of the disease are composed of maternal, fetal, and paternal factors. 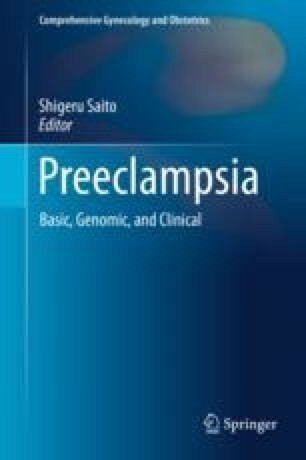 In this chapter, genetic research into preeclampsia was reviewed from diversified perspectives including recent approaches of genome-wide association studies and immunological genetic analysis of human leucocyte antigens. In the last few decades, extensive research by basic, clinical, and epidemiological fields revealed a variety of causative genetic factors, including maternal activin receptor type 2 gene, inhibin beta B gene, paternal glutathione S-transferase P1-1 gene, and fetal catechol-O-methyltransferase gene. However, major problems in genetic research include a relatively small number of cases, the diversity of genetic racial background, and unstandardized diagnostic criteria for the disease. On the other hand, recent innovative progression of system biology may enable us to discover unknown mechanisms through the use of very large genetic databases. To uncover causal relationship between genetic and environmental factors in preeclampsia, large-scale association studies with familial pedigree information should be undertaken by collaborative global networks. Uzun A, Triche EW, Schuster J, Dewan AT, Padbury JF. dbPEC: a comprehensive literature-based database for preeclampsia related genes and phenotypes. Database (Oxford). 2016;2016. pii: baw006. doi: https://doi.org/10.1093/database/baw006.